I question that I am frequently asked is “What is a Section 333 Exemption?” then usually, before I even have a chance to respond, the follow-up question of “Do I Need One? hits. Why is this question so common? The answer is simple, like many nascent industries, the drone industry is filled with misinformation, so it’s only natural for people to look for an industry authority that they can trust. Section 333 of Public Law 112-95 grants the Secretary of Transportation authority to allow certain UAS to operate in the NAS prior to the completion of the small UAS rule. Essentially, the grant of exemption permits the Secretary of Transportation to determine whether certain UAS may operate in the NAS without the UAS meeting all regulatory and statutory requirements for manned aircraft, such as aircraft certification. The FAA issues an exemption to facilitate this decision-making process and to provide relief from current FAA rules where appropriate until final rulemaking is completed. 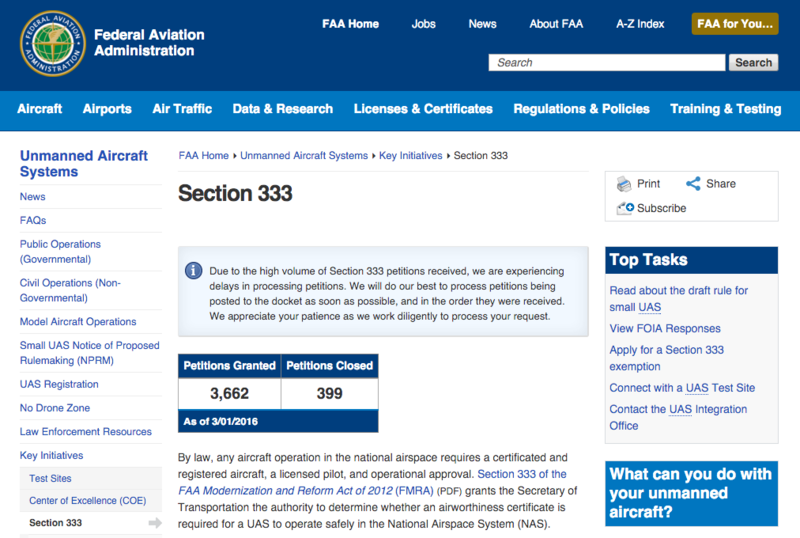 Specifically, Section 333 allows the Secretary to determine which types of UAS, as a result of their size, weight, speed, operational capability, proximity to airports and populated areas, and operation within visual line-of-sight, do not pose a hazard to NAS users or to national security, and whether an airworthiness certificate or COA is required for operation. A Section 333 grant of exemption is required for any civil UAS operation that is not for hobby or recreational purposes. What is a Section 333 Exemption? How many customers will want to purchase services from an “illegal” operator? Would you feel comfortable with a “pirate” drone operation flying over your daughter’s wedding? How about an expensive piece of real estate? This is a huge competitive advantage. Now is the time to act. Every day that you don’t apply for an exemption is time that you are not building your business ahead of intense competition. This opportunity will never, ever, come around again. While the standard period is 120 days, the FAA has been experiencing a well documented backlog. That means you should expect delays, as processing times are currently much longer than the standard 120 days. What will I need, in addition to my drone education, to qualify for a Section 333 Exemption? The unexpected gotcha is here. To qualify for a Section 333 Exemption you will need an FAA-issued pilot certificate. If the aircraft is issued an airworthiness certificate, a pilot certificate is required. Pilot certification requirements for petitions for exemption under Section 333 are evaluated on a case-by-case basis. While Section 333 grants the Secretary of Transportation flexibility with regard to airworthiness certification requirements, it does not grant the Secretary any flexibility with regard to airman certification standards as outlined in Sections 44703 and 44711 of Title 49 of the United States Code (49 USC). An FAA airman certificate is required to operate an aircraft in the National Airspace System. While this may seem like a lot to swallow, you have to remember that when you invest in your drone education, you are investing in your future. Legal drone operators with valid Section 333 Exemptions are in high-demand. At Drone Universities, we designed our curriculum to teach you the skills you will need to succeed as a commercial drone operator today. We even offer the lowest cost route to an FAA-issued pilot certificate, but you don’t take have to take our word for it. What is a Section 333 Exemption? It is an exemption, issued by the FAA, that allows drone operators to legally operate in the national airspace. Do I need one? If you fly your drone commercially, then yes. There is no drone license .. no FAA 107, FAR 107, 107, 107.1FM or anything. Until the FAA changes the rules, if you want to fly commercial, fly safe and legal, fly with an FAA-issued Section 333 Exemption. So now you are probably asking yourself, “How do I get a Section 333 Exemption?” It must be expensive right? While it can be, it doesn’t have to be. At Drone Universities, we provide our qualifying graduates with free Section 333 Exemption petition services. That’s right, you get educated and we handle the paperwork. It’s as simple as that.